Hi everyone! Long time no see. I have been busy raising two little humans and I can proudly say that the youngest of them can hold her head on her own, which makes things much easier 😀 Apart from that parenting gig, I have also been busy performing some kitchen magic. As you might remember from my garden tour, we have tons of calendula flowers and lemon balm growing (tons = more than we can use fresh. Not actual tons). 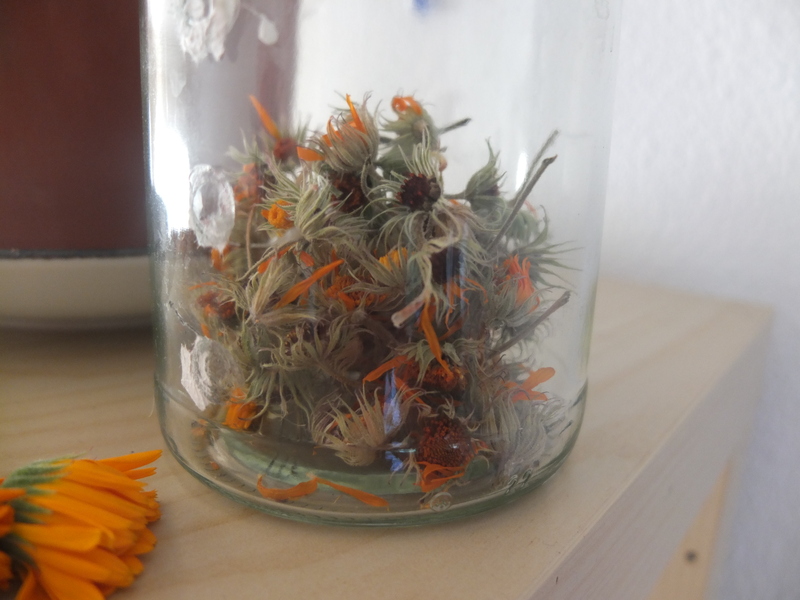 So I decided to preserve those beautiful herbs by drying them, which is ridiculously easy. For most herbs, hanging them upside down in a dark room for a week or so will work wonders. I used the pantry room to dry the lemon balm and I put the fresh lemon balm in one of those nets that lemons and oranges are sold in. That way the air could circulate freely and they dried in less than a week. 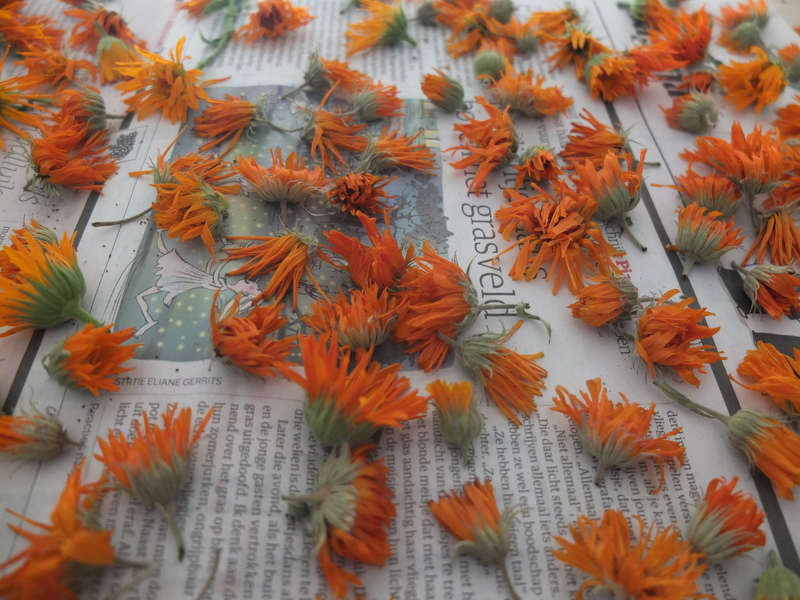 For the calendula flowers the process is also very straight forward but requires a bit more patience, as they hold much more moisture. I just spread a few newspapers and then put the flowers there. The petals dry quite fast but the lower, green part needs more time. 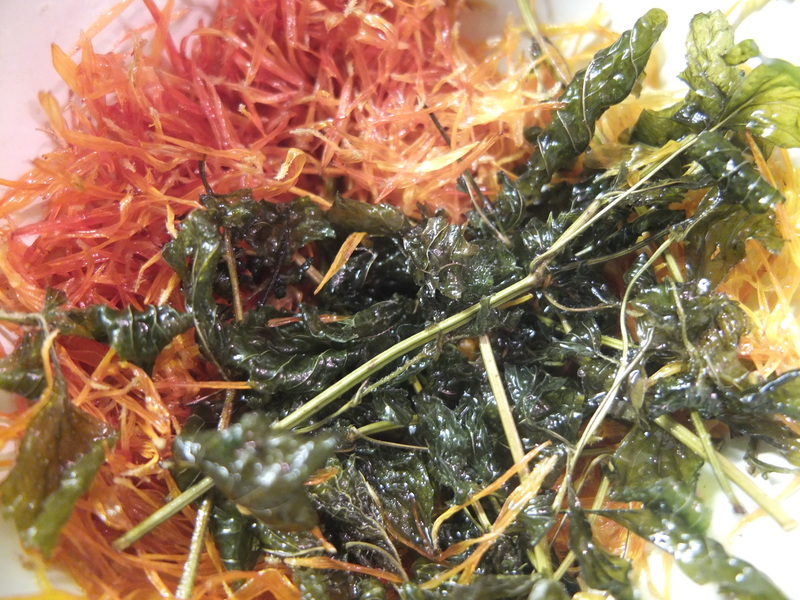 It’s a good idea to dry the whole flower, as it is also the green parts that have medicinal properties. Plus, if you want to only use the beautiful orange petals for a risotto or to make a soap, they fall right off the stem, when they are dried properly. 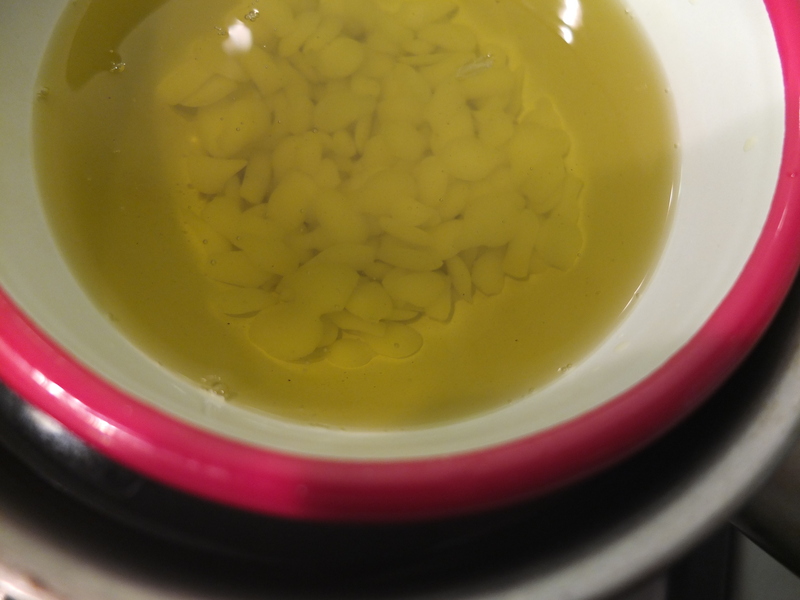 The first step to a herbal ointment is to infuse the base oils that you are going to use. This can be done two ways and I have used them both. The cold method requires tons of patience. I am not really blessed with that quality as a person (though I am getting a bit better as I grow older), but I had bought a lavender plant in a pot and it was dying so I cut all the flowers and threw them in a jar with olive oil and then forgot it in the pantry for 3-4 weeks. That’s basically how the cold method is done. Some people recommend putting the oil in sunlight, as it speeds up the process, but others insist shade is best. So yes, 3-4 weeks or more is the key here. For those of you that are impatient as hell, the hot method works best. You basically put your herbs in a double boiler (pot with water and in it another pot/bowl with the herbs in it, covered with the oil that you want to infuse) and then let them simmer at a temperature as low as possible for a long time. For example, I did 7 hours in our oven at about 60C. I tried at the stove top first, but we have a gas kitchen and even the lowest setting brought the water to a boil really quickly. And it is important that the water DOES NOT boil, but only steams, as otherwise your herbs will soon get burnt. I have read that people consider their oils infused after as little as 3-4 hours. Supposedly the hot method leaves less room for mold to develop. Just make sure to strain your herbs really well. 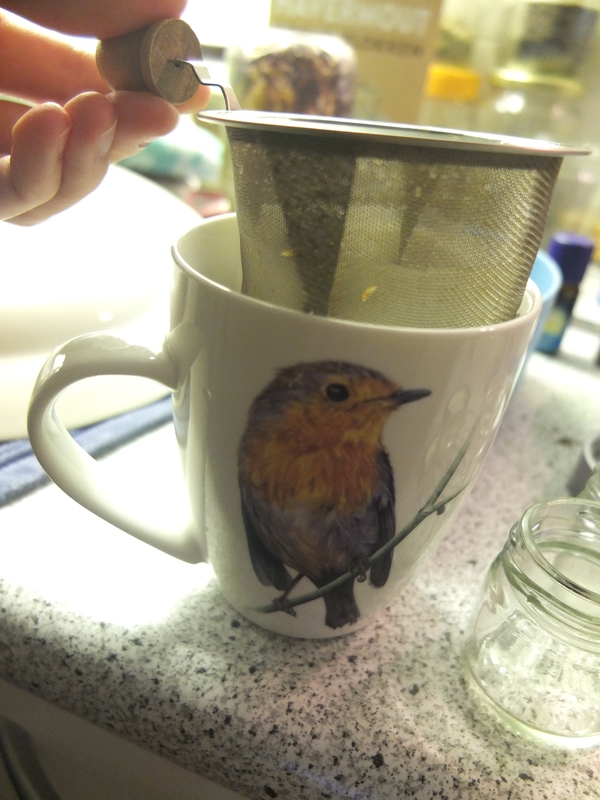 I used a fine tea strainer to strain the herbs. Why is the picture quality so bad? Because when you have two kids, you do your kitchen magic at 12:00 at night with the horrible kitchen lights on. that’s my makeshift double boiler. The drop-like shapes at the bottom are the bee’s wax. This depends on many things, including but not limited to: your skin type, the availability, your budget, your cultural background. And since I am Mediterranean, a lot of olive oil went into my ointments 🙂 I also added sweet almond oil, that is supposed to be fabulous for your skin plus some coconut oil because I had bought some to make crispy tofu triangles and all the hippies out there swear by it anyway, so why not? (pretty scientific approach, as you can see). Just keep in mind that some oils don’t do well with heating. Flax seed oil for example is super healthy when eaten raw, but once you heat it, its soul kind of dies, so keep that in mind when you make your supply purchases. And if you are a complete beginner, like me, staying on the cheap side is probably the wise thing to do. It’s totally up to you and essential oils are optional really. There isn’t tons of scientific evidence out there that they actually work (or how they work) anyway, at least not for the majority of them. They do smell wonderfully though. You can find tons of lists on the internet with titles such as “the best anti-aging essential oils” or “the best essential oils to treat muscle pain” etc etc. So get out there and do your own research. What I discovered is that most of them seem to “be wonderful for your skin but makes sure to dilute them in a base oil first”. Which is exactly what you do when making an ointment, so no issues here. NOTE: It is VERY important to make sure the ointment you make stays out of the reach of children. The same goes for your supplies. If you want to make an ointment to use on your kids as well it’s best to leave out the essential oils or use only a few drops. Disclaimer: Lets keep it honest. For my own ointments I used bee’s wax. You can make them vegan by substituting with cocoa butter and/or coconut oil, that are solid at room temperature, in order to have a body butter consistency. Basically all you have to do once your oils are infused is to add in the essential oils, stir and pour into jars. Here are some basic numbers to get you started: You don’t want to add more than 5 drops of essential oils per tablespoon of base oils. And erring on the safe side, I would suggest not adding more than 3 drops per tablespoon. Keeping it to just a couple of drops for children is the best thing to do. Now, depending how soft and creamy you want your ointment, you can try different ratios of wax/cocoa butter/ coconut oil. Some people like to keep it simple and will only use coconut oil as their base oil, since we know it is solid at room temperature but still melts easily when it comes in contact with the skin. 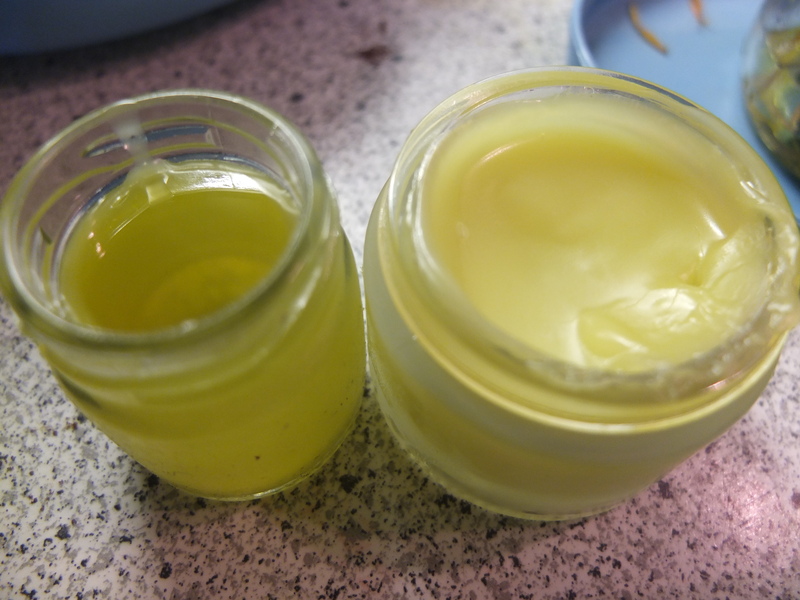 What I used was 1 tablespoon of bee’s wax per 8 tablespoons of base oils and I got super soft but still solid ointments. the jar on the left was just poured while the jar on the right has already cooled a little. Make sure to stir a bit when your ointment starts to cool, to make sure the essential oils spread evenly. 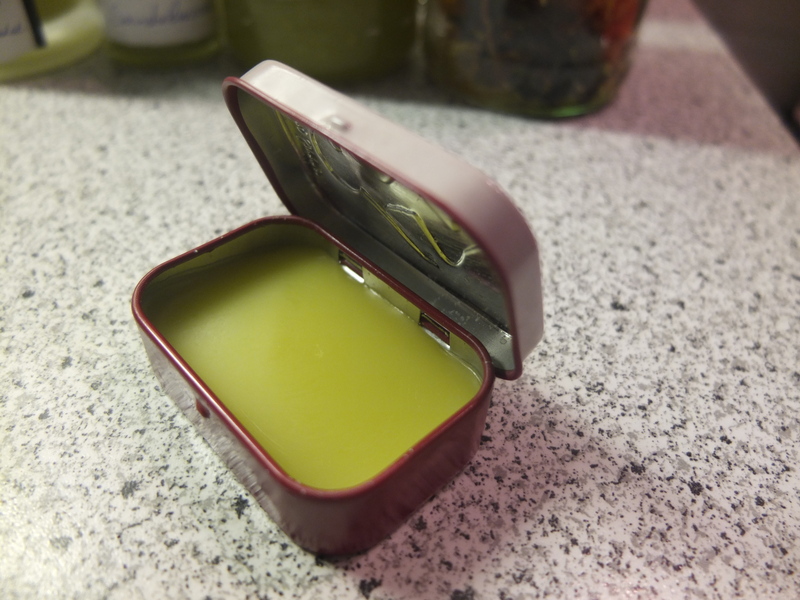 Loulou Maya requested her own cream, so I filled an old mint tin with plain calendula -lemon balm infused oils. According to her, it heals everything. 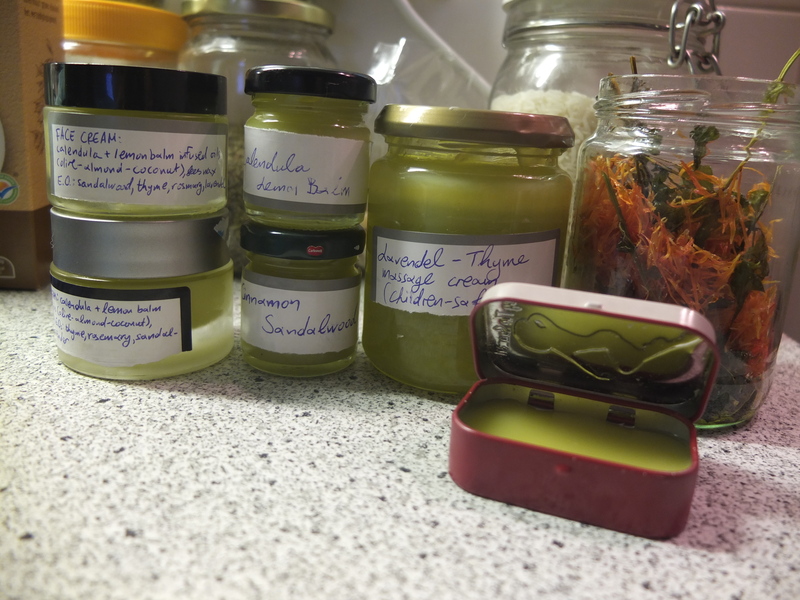 In that last pic you can see the products I made using a packed cup of herbs. For the face ointment I used the calendula -lemon balm infused oils and I added sandalwood, lavender, thyme and rosemary essential oils. 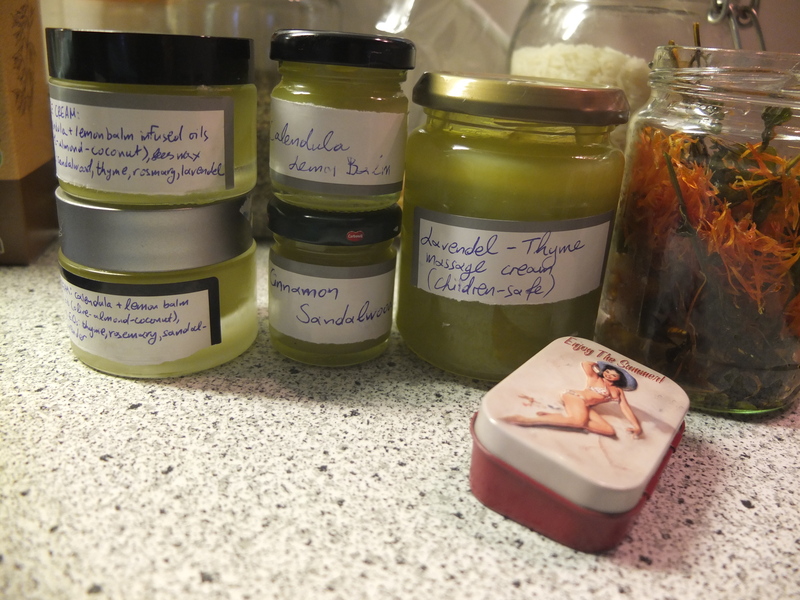 I also made an autumn/winter cinnamon/sandalwood infused ointment, to warm me up a bit during the first cooler days and nights that are coming. I kept a small jar of plain infused oils without any essential oils in them, to use on scraps and scratches and bruises and then I made a child-safe lavender – thyme infused oil. Thyme is supposed to help with coughs and lavender is supposed to help with relaxation and sleep, so when those winter viruses hit, that will come handy. Keep in mind that with small babies you should only rub their feet with such ointments and put socks on, so they don’t get it on their little hands and then in their mouth. Avoid rubbing it onto their chest as well, since the essential oil smell can be pretty strong and actually cause even bigger breathing issues. A note on the face ointment: This is obviously oily. While it is wonderful to use topically on dry spots, I wouldn’t really use as a day cream, especially if you already have oily skin, as it can cause break outs. It is great to use if you do the oil cleansing method: steam your face using a hot wash cloth, massage the ointment in your skin and do another round of steaming with the wash cloth (essentially touching your face with the hot wash cloth, so that the pores open up). I like to do this at night and use my day cream with a bit of tea tree oil mixed in for the day. So as you can see, getting started with your herbal first aid ointments or your very own, personalized skin care is not hard at all! Try it and let me know how it all turned out. Good luck!